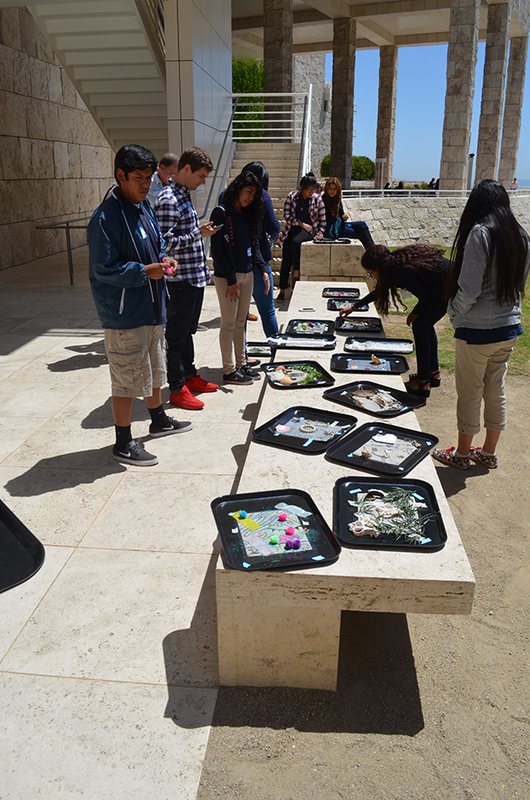 This spring 25 high school students from Ánimo Venice Charter were invited to explore analog photography, write artist statements, and exhibit their work to the public as part of the Community Photoworks program, organized by the Education Department of the Getty Museum. 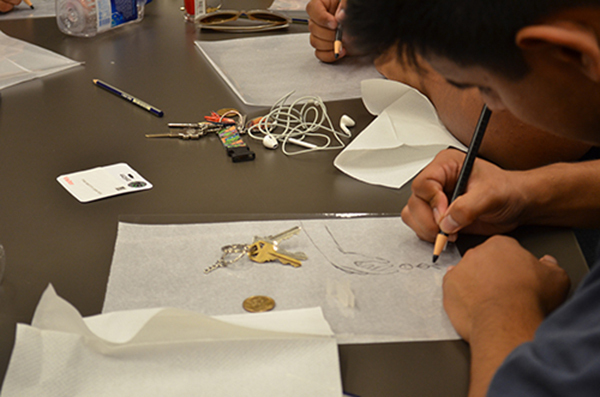 This marks the tenth year in a row that the Museum has partnered with the nonprofit arts and writing center 826LA (http://826la.org/), as well as a practicing artist, to introduce students to photography and involve them in the process of art-making and display. On April 16, curators Virginia Heckert and Mazie Harris gave the students tours of the photographs exhibition Light, Paper, Process: Reinventing Photography, emphasizing the sense of experimentation and the unique practices of the seven contemporary photographers whose work is featured in the show. 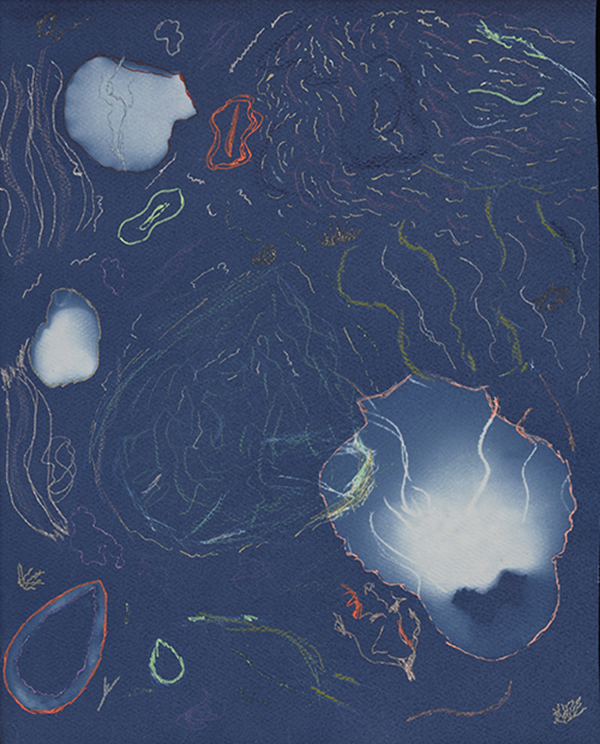 To create their cyanotypes, participants first drew on a transparent sheet of acetate with an opaque wax marker that would block the light. 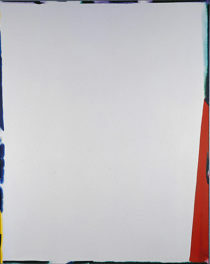 Then they placed objects on top of the acetate and slipped a sensitized sheet of photographic paper underneath. Christine asked the students to consider the outline, shadow, and sense of depth the objects would make. 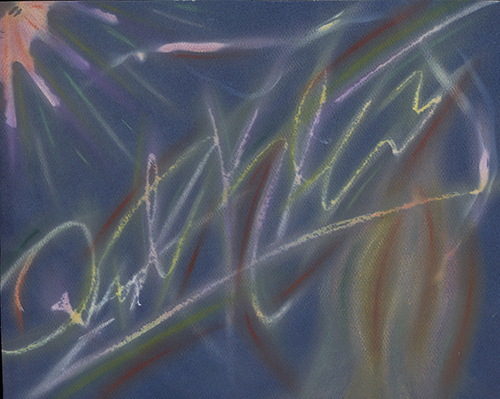 The next step was to expose the piece to the UV rays of the sun for five minutes. In the final step, the work was rinsed in water, which functions as both developer and fixer, for about one minute. The completed works were then set out to dry. 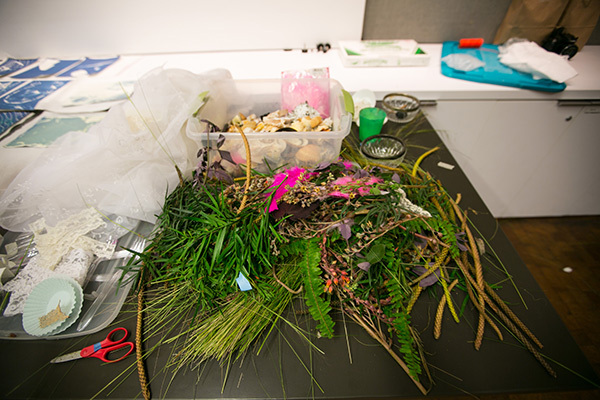 Through this process, students transformed ordinary objects, such as shells, leaves, stems, clippings from succulents, swatches of lace, jewelry, and keys into amazing abstract compositions. The stark contrast between the white silhouettes of the objects and the intense cyan background created a dazzling effect. Here are just a few of the beautiful images students created. The project proved a good pairing between the artist and the teens, who got to directly experience the materials Christine uses in her own practice. 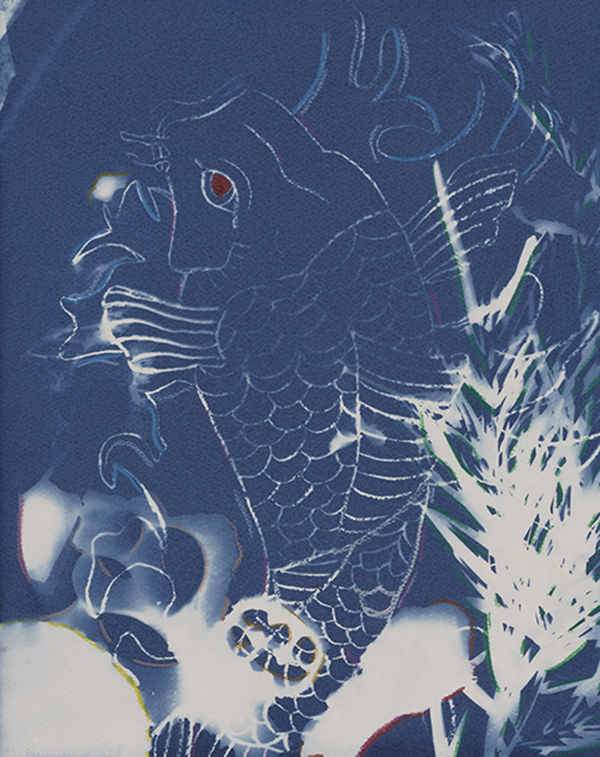 She combines various media with her cyanotypes, such as drawing, painting, and collaging. 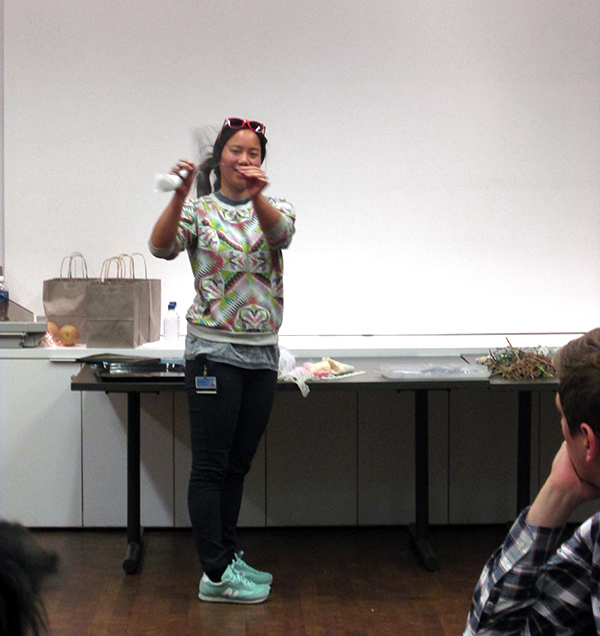 For Christine, the project was an opportunity to share the artistic process with creators of a younger generation. “Being creative has always been a meditative outlet for me, and it’s important in everyone’s life,” she told me. 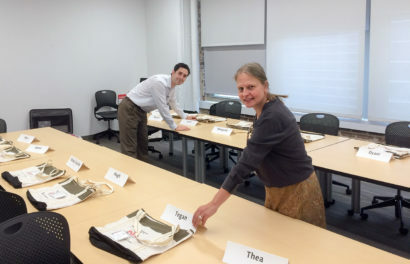 “I hope the students will enjoy the creative process as much I do.” In her view, Community Photoworks is a great way for artists to interact with students and the community, and for students to encounter artists and art. A novel part of the program this year was the students’ participation in recording of a live interview with the practicing artist. Harking back to the exhibition’s theme of reinventing photography, the students prepared by considering how Christine herself has “reinvented” photography. They were curious about her influences, her constantly evolving artistic practice, and what her work symbolized, in addition to where she thought the future of the medium was heading. They also wanted advice on how to proceed with their own artistic endeavors. Here is a highlight from the conversation. As the final step in the project, the students’ work will be publicly exhibited in an exhibition titled Indigo Noir. 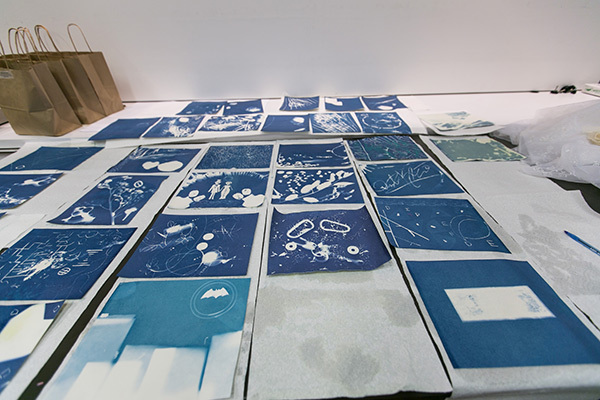 Their cyanotypes will be paired with artist statements written with the support of 826LA volunteers, to reflect the intention and power behind their work. The exhibition will be on view at the Coffee Connection (3838 Centinela Avenue, Los Angeles 90066), during the cafe’s business hours, from May 25 to 31. And please join us for a free reception to meet the artists on Wednesday, May 27, 2015, from 6:00 to 8:00 p.m.
As associate education specialist at the Getty Center, I encourage visitors to spend time looking closely at art in the hopes of sparking curiosity and inviting dialogue to inspire multiple levels of experience. My passion for the arts was piqued while living in London, where I completed the Christie’s Diploma Course in Fine and Decorative Arts, followed by a master’s degree in art history from the University of London, Birkbeck. 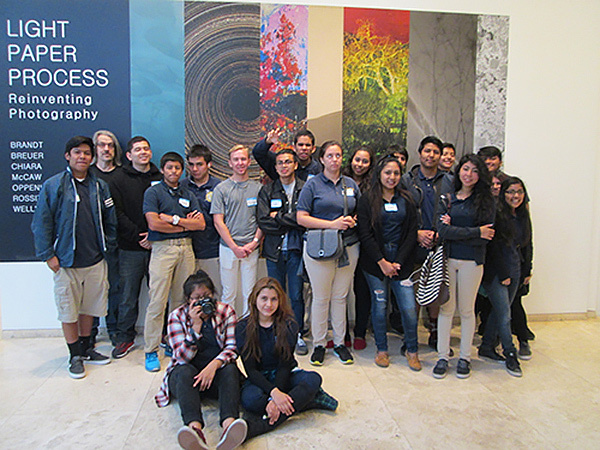 My current project, Community Photoworks, is a collaboration between the J. Paul Getty Museum’s Education Department, the nonprofit tutoring center 826LA, and Ánimo Venice Charter, a Title I high school in LAUSD.